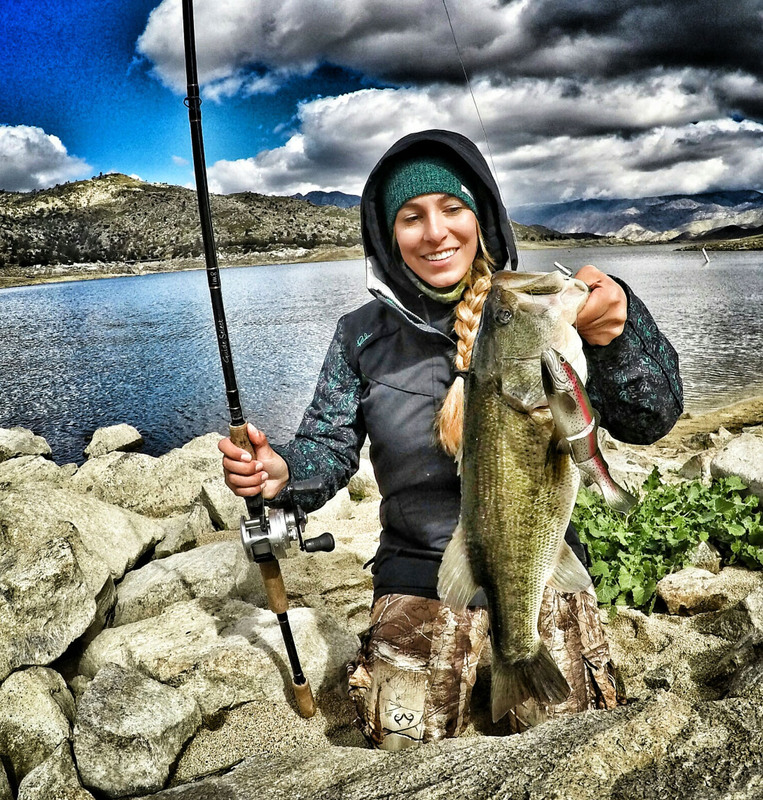 This Month’s Fishin Chick is brought to you by Hoven Vision and we would both like to introduce Kayla Nevius. Kayla Nevius: I live in California. Kayla Nevius: I’m starting a job as a Juvenile Corrections Officer at a boys camp. I’m very excited about being able to work with youth who are going through a difficult time in their life so i can try to make a difference. Kayla Nevius: I love to hunt, bowfish, go frogging, catch crawdads, snowboarding, wakeboarding, and pretty much anything else outdoors! BD: Who got you into fishing and how long have you been pursuing it? 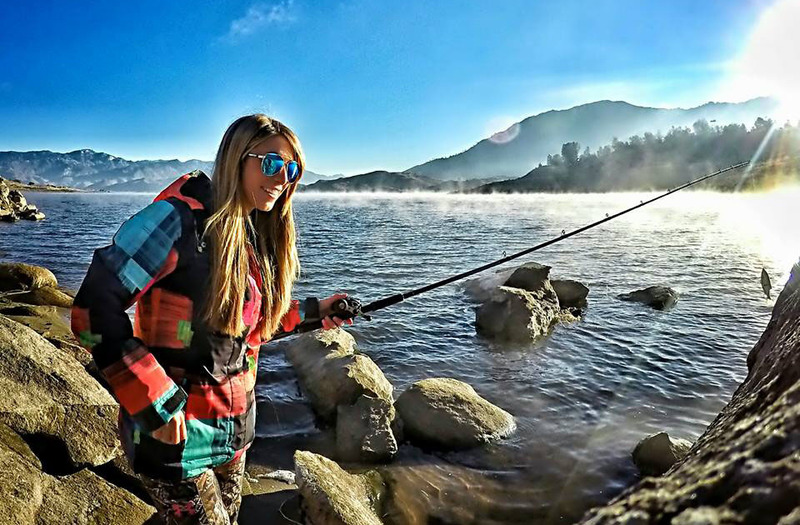 Kayla Nevius: I started fishing with my dad before I can even remember. I have pictures of me when I was just a few years old catching bluegill and pictures soon after that catching trout and largemouth bass. I always did a lot of fishing with my dad growing up, but within the last few years I’ve gotten more and more serious about it. Kayla Nevius: I grew up fishing my local lake for trout, catfish, largemouth bass, crappie, and bluegill and our river also has smallmouth bass. A few times a year we would vacation in Ventura and catch perch and corvina to eat while we were away. 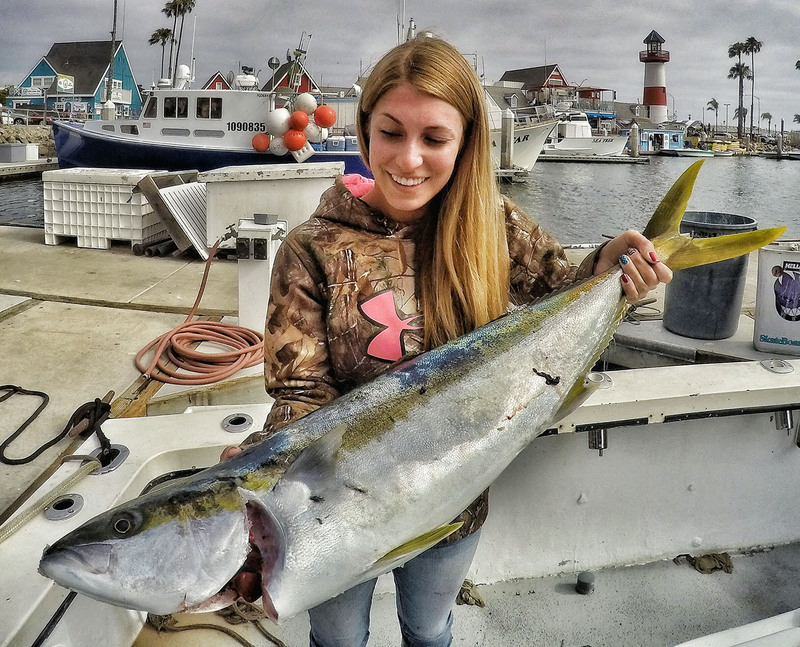 Last summer I finally got to go deep sea fishing for the first time and caught some yellowtail and yellowfin. This year I spent some time offshore out of San Diego and Dana Point, which enabled me to cross some more species off of my very long “to catch”, list. I caught some dorado, rockfish, salmon, grouper, croaker, lingcod, and a couple others. 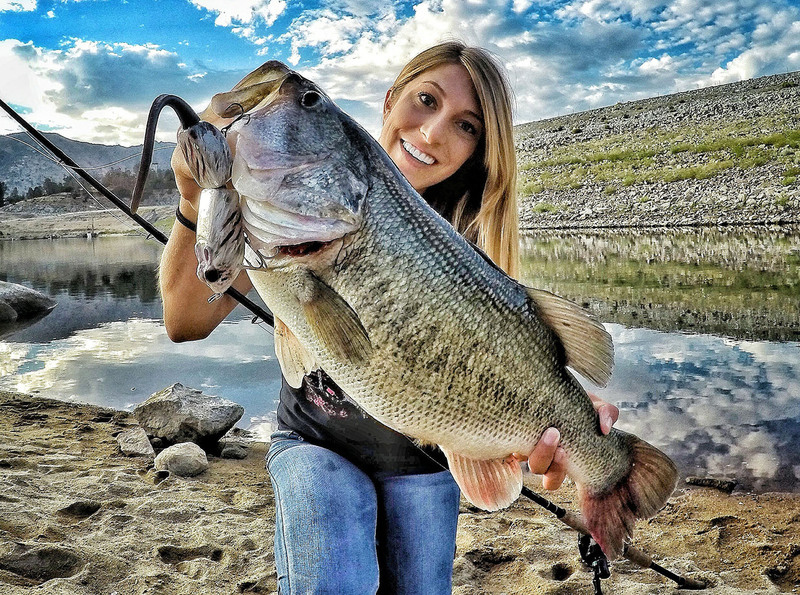 Kayla Nevius: By far my favorite fishing is largemouth bass fishing. I’ve dedicated more time to that than any other hobby I’ve ever had. 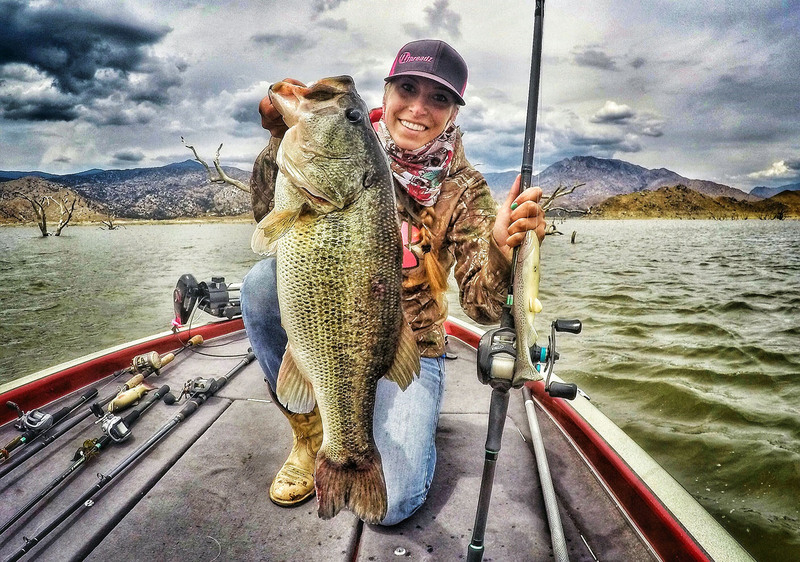 Kayla Nevius: My future fishing goals are to make sure that I always enjoy it. My plan is to keep working at becoming a better fisherman, to study more, spend more time on the water, and to keep catching bigger bass. I’ve been asked a lot about if I’d want to fish professionally, and of course the answer would be yes! I would love that opportunity. But, as long as I’m able to keep fishing just as a hobby I’ll be happy. 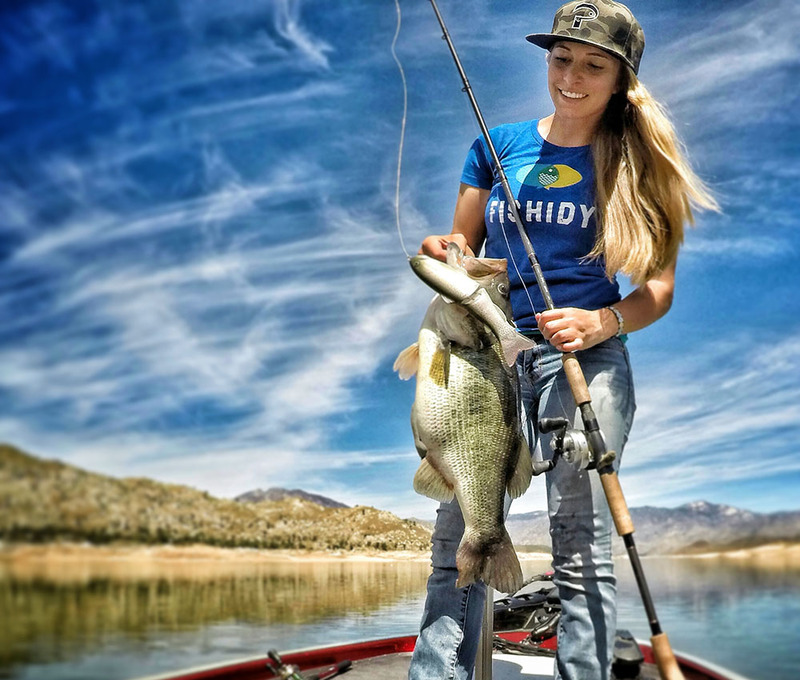 Kayla Nevius: I’d say my favorite part of fishing is not knowing when I’m going to catch that big fish I’ve been putting so much of my time and energy into catching. When I’m not fishing, I’m wondering if right now is when I would be catching my next personal best bass if I was on the water. Never knowing when it will happen is what keeps me getting up before the sun does, going out on cold rainy or snowy days in the winter, or the hundred plus degree days in the summer. The whole time I’m on the water I’m just focusing on what I need to do to make my bait swim perfect to get that big fish to commit. Once that fish hits my bait the adrenaline gets pumping especially if I can feel it’s a nice one! BD: What are some of your proudest moments in fishing? 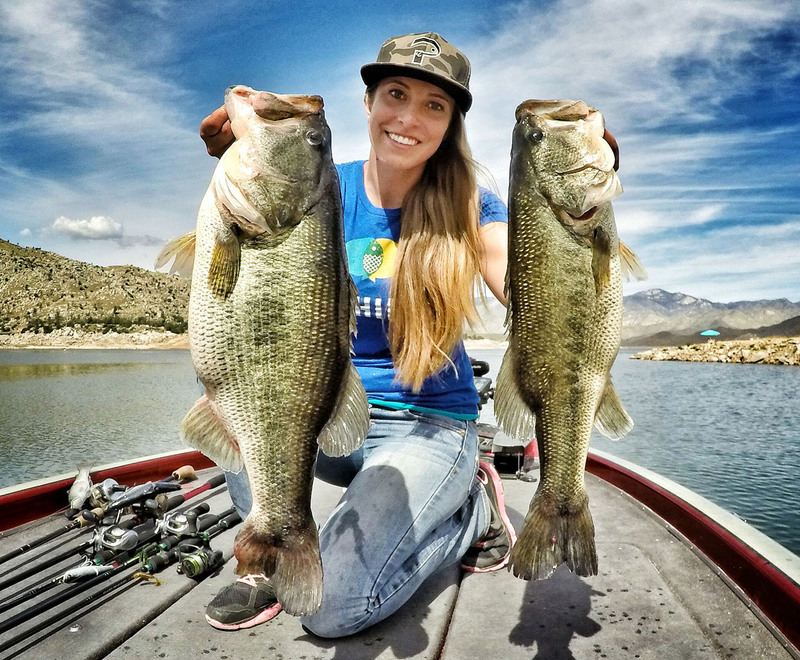 Kayla Nevius: Last year I caught my personal best bass weighing in at 10.5 pounds, which ended up being a life changing catch for me. That fish turned my passion for fishing into an obsession. I bought myself a bass boat and I completely switched from using live bait to exclusively using artificial lures. I started fishing tournaments, and literally spent every free second around work and sleep on the water. When I picked up swimbaits, I started catching big fish all of the time. One of my most memorable moments this year was catching my personal best for the year at 8-pounds 2-ounces one morning before work on a topwater Nezumma Rat. It was just a super calm and peaceful morning fishing alone while the sun was rising, and the topwater blow up was amazing! About a week later I broke my personal best again on a Black Dog Bait Company Punker by one ounce weighing in at 8-pounds 3-ounces. That was a super memorable moment because I was fishing with my dad right before the sun went down, and I was explaining to him everything I was doing to make the bait swim how I wanted it to, and why I was swimming it like that. Right as I was explaining it there was a huge topwater blow up!! My dad was super excited, and so was I for breaking my personal best for the year again! 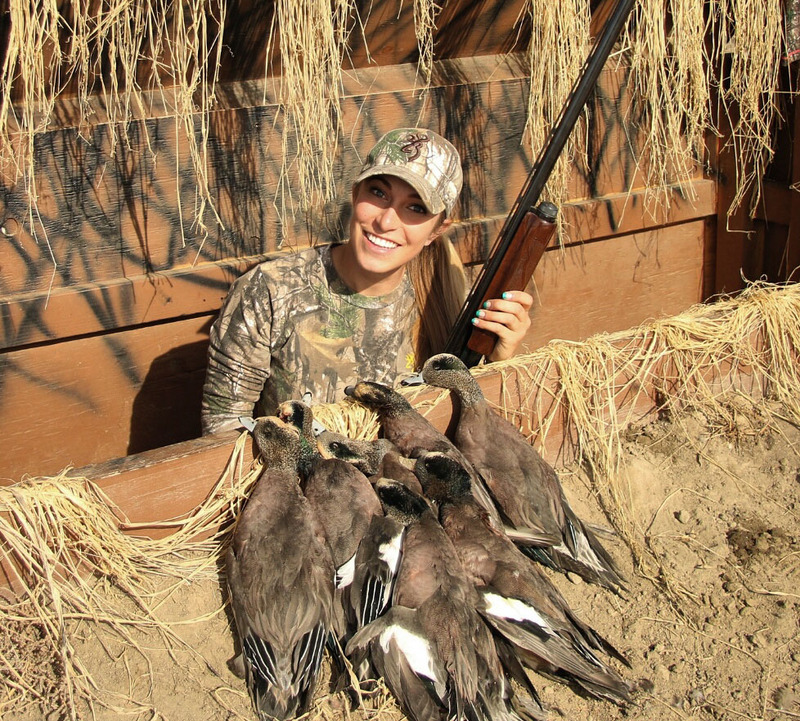 Kayla Nevius: Besides fishing, hunting, and everything outdoors, my other passion is helping people. I graduated with my Bachelor’s Degree in 2013 from CSUB with a major in Child, Adolescent, and Family Studies and a minor in Psychology. My job right out of college was working one-on-one with youth as a mentor during difficult times in their lives. I would help them with social, behavioral, academic, mental, physical, and any other aspects of their lives they needed help improving on. This was more of a passion and something I looked forward to every day, rather than an actual job. Unfortunately because of a company hardship my position was changed, but I just got a new job that will allow me to do just that. I’m very excited. Our thanks to Kayla Nevius for sharing her story with us and to Hoven Vision for their partnership in it. Born and bred in Florida, Krista Tucker holds a captain's license and loves to fish redfish tournaments.